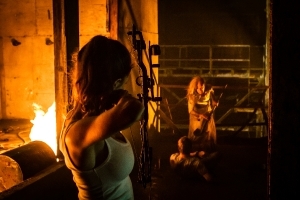 Archstone Distribution has acquired the rights for the Canadian action-packed horror movie Blackburn under its genre arm, Tombstone Distribution. In celebration of the deal, the company also released the second trailer for the film. Horror fans will spot some familiar faces in Blackburn, which stars Ken Kirzinger (Freddy vs. Jason), Brad Loree (Halloween: Resurrection). Also cast are horror genre veterans Lochlyn Munro (White Chicks) and Emilie Ullerup (A Little Bit Zombie), along side Disneyâ€™s Calum Worthy (â€œAustin and Allyâ€), Sarah Lind (Wolf Cop), Zack Peledeau and Alexander Calvert. The film is directed by Lauro Chartrand (Born to Raise Hell), and written by Nastasha Baron (Kingdoms of Grace). Blackburn is set in a small Alaskan ghost-town with a horrifying history. A forest fire and rockslide have trapped five bickering college friends overnight. Seeking refuge inside the abandoned Blackburn Mine they must try to band together as they are mysteriously slaughtered one-by-one.